The human resources management is said to be one of the fast paced department, it is hence essential to seek leadership as well as training in order to gain skills linked with hiring executives. People related challenges and issues are dealt by human resource managers. It is also the duty of HR managers where they advise others to handle situation in the right way. The HR manager is the one who works directly with the employee to solve any issues. 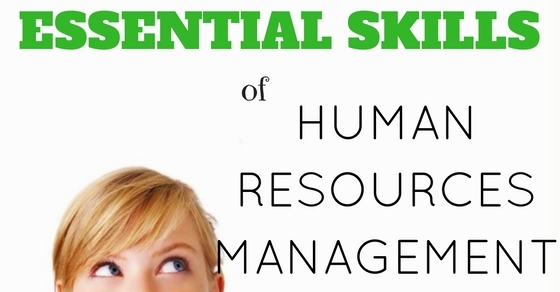 Mentioned here are few mandatory skills of HRM. The HR managers are ones who deal with intermittent leave questions, personal issues of employees, a recruitment task for a tough position, and more. An HR manager is not one who deals a single aspect but many as the business moves fast and priorities also pace at the same time. Hence the main skill for human resource management is the multitasking capability to handle many tasks at a single time. In order to be an effective hiring manager it is necessary to possess strong interpersonal skills as well as decision making skills. Since they are to deal with the interview process and hiring, the human resource leaders should be able to communicate in an effective manner and present the company also, and they should also be organized. There is a tone set up for the complete HR process which is the HR manager whom the candidate meets initially. Along with this, face-to-face skills are ones that influence top talent; the HR managers should possess the skill where they are able to identify best practice process, so that competing candidates can be evaluated. The top HR managers in the department should assist in training other HR managers so that they are consistent in hiring process across divisions. The HR managers are ones who are able to express by ways of communication in a clear manner and also in writing. There needs to be good communication skill for HRM as the memos posted, policy handbooks, and posted information and more are examples of their creation. One-to-one speaking or speaking to a large number of audiences is another skill which HR managers require. The capability to listen with empathy is another skill which an HR manager must require. The HR managers should possess the capability to clearly understand the problems that has occurred before they could handle them, as they deal with a number of issues on and off the job. This is one another important skill that an HR manager needs to develop. He must be successful enough and possess the capability to negotiate. At times when offer for an employment is extended for an employee, negotiation also rolls out and has two varied sides. It is only that a strong HR person would be the one who can work for both sides and conclude with a solution which makes everyone involved quite happy. Problem-solving and conflict management as a combination is another skill which is necessary for HR managers. It is a true fact that not all employees in an organization go well with their co-workers or managers and hence there would be more chances for managing conflicts and solving problems. It is the duty of a capable and effective HR manager to make sure that employees work together in civil manner and this in turn leads to quick working situation with quality output. An effective compensation system and benefit structures must be developed by the HR professionals as they get along and work with the management. In order to obtain new talents and retain them in the organization, compensation and benefits must be framed in the right way. In order to assess the overall package as per the industry norms and also to present insights to the managers, the employees should possess negotiation, analytical and problem solving skills. The needs of management and employees are balanced by the HR managers and they are able to win trust from all concerns. The process of implementing performance improvement process is challenging but is considered as a rewarding role for human resources as they assist in ongoing professional development. When the evaluation is done in a productive manner, developments are framed in a positive manner with assessment skills and versatile communication. The human resources program is one which teaches about conflict management skills and also understanding of the problem from both sides. Another important asset for a human resource management is the training and development aspects. The HR managers should possess the capability to develop training programs which would be one that solves human performance aspects and also reap good benefits to the organization. To produce tangible results for the organization, the HR department should possess presentation abilities, instructional design skills, and best training programs. The HR management requires perfect organization skills where there should be an orderly approach in whatever they do. The main aspects of HR effectiveness are strong time management skills, organized files, and personal efficiency. The HR management is a place which deals with careers and lives of many people and so whenever a HR manager requests for any details regarding termination or compensation, details must be retrieved easily. The HR management must possess the capability to act with incomplete or also best available information. They also need to have the knowledge as when to seek the help of experts, professionals and colleagues. The main consciences of any organization are the HR managers and they are also said to be the keepers of confidential information. The HR department is one that deals with the top level of management and must follow and make sure that the regulations and policies are followed in the right manner. The human resource professionals are the ones who address the concerns of the employees and manage the policies as well. When an HR management who balances this act is able to win others concern. There are situations where the decision should be favoring the employee and sometimes for the organization, its values and cultures. Flux is the state for almost all organizations. Matrices, task forces, teams are used to perform their duties and also disperse as other forms. There are many hierarchies that has squashed and there are about four or five generations which work. With the present scenario, a number of people have been freaked out. All these changes have to be coped with the HR and hence change management is a necessary skill. The human resource management has objectives, goals, budgets and people to manage. The functioning of the human resource management in the organization along with its strategic plans must be well understood by the HR management. They also require having a good understanding of how other departments work and their performance measurement. The HR management must also possess skills about contribution to the organizations like training, development, staffing and other departments under their influence and control. The HR management should be sound at understanding non-verbal communication and voice inflections apart from what other people tell them. It takes time for this soft skill to be developed. By possessing this skill, the HR manager can make out if the person is speaking the truth or not, or if the employee is trying to get something out of them. There should be fairness demonstrated from the HR management towards all employees. This intends that there should be a clear communication, the voices of people must be heard and that all the policies are followed. The HR management must also make sure that respect and privacy is also maintained. The main skill the HR management needs to possess is to assist, coach and develop the employees. The main intention of the HR management should be remediation, continued improvement and innovation. The HR professionals are also to make use of technology and update themselves so that the HR function is improved. It is the forward thinking professionals in the HR management who takes responsibility for leadership role and also assist the management’s strategic way. There are few skillsets which directs to business growth which include monitoring and filling the labor needs of the organization, bringing in new skill sets for business growth, and revision of compensation outlines. The organizations have hierarchies which are headed with supervisors which is mandatory for HR management. The HR managers should be ones who are able to understand the team dynamics and work in order to bring in disparate individuals and develop team work. Technology is one aspect which has turned the world into a sophisticated and global talent pool. There are number of software applications and tools that are used in the HR management these days and the HR management must be updated and follow the latest technology. There are number of HR competencies such as applicant tracking software, human resource information system, data analysis, and plenty more. This is another essential skill for HR management to possess. There are many skills which needs to be followed in order to master in HR as career, in that aspect there are few skills which needs to be developed from the start of the career itself. The service delivery and information is followed where HR information is managed professionally. There should also be a perfect organizational design which enables to manage structural change. Apart from this there should also be organizational development where culture, values, work force and environment would satisfy the goals and perform perfect in future. There should also be learning and development, resource and talent planning for any individual to become a perfect HR professional. More over there should be perfect reward system where skills, experiences and rewards are rewarded in the right manner. Employee engagement is another important aspect which develops a positive relationship in work environment. Along with these, entire employee relations are also important where there is a perfect relationship between the organization and the employees. These are few aspects which are requiring for HR management professionals in order to reap success in their career. These are few mandatory skills required for HR management which is mandatory to be followed by the management. The HR management in any organization is hence to glimpse through and follow these hints in order to be successful and gain a positive reward from others. All these skills are to be noted for HR enthusiasts as they need to develop these skills from their early stage of career and fix it up in their mindset. By this way, they would know the right skill development and move in the right path. They should look out of ways for developing such skills so that they do not face any issues at time of career. Also the HR professionals today should make a point to follow these skills and enhance their job role. Since HR department is a crucial one in any industry which is transparent, there needs to be perfect skill development for each and every professional in the team. They are ones, who develop leaders and push the organization to top level and hence, skill development is to be followed in all organization as a part of their career. HR’s would definitely be benefited by these points as they are beneficial and would put them towards success. There are also many other sites which convey such beneficial points about skill development for HR management.